Dimensions 0.18 by 7 by 10 in. Amazon.com description: Product Description: The Poison Belt - By Arthur Conan Doyle Ã¢ÂÂ A Classic Novella. 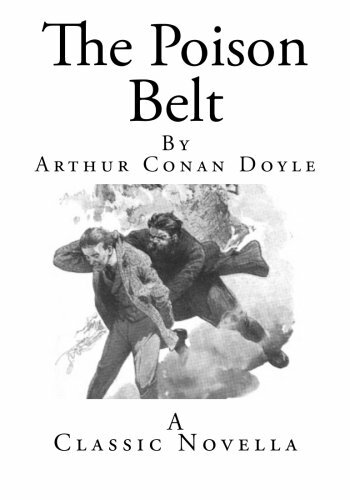 The Poison Belt was the second story, a novella, that Sir Arthur Conan Doyle wrote about Professor Challenger. Written in 1913, roughly a year before the outbreak of World War I, much of it takes place in a single room in Challenger's house Ã¢ÂÂ rather oddly, given that it follows The Lost World, a story set in the jungle. This would be the last story written about Challenger until the 1920s, by which time Doyle's spiritualist beliefs had begun to influence his writing. Challenger sends telegrams asking his three companions from The Lost World Ã¢ÂÂ Edward Malone, Lord John Roxton, and Professor Summerlee Ã¢ÂÂ to join him at his home outside of London. The cryptic telegrams also instruct each of them to bring a tank of oxygen. When they arrive they are ushered into a sealed room, along with Challenger and his wife. In the course of his research, Challenger has predicted that the Earth is about to come into contact with a belt of poisonous ether, which will, based on its effect on the people of Sumatra earlier in the day, cause the end of humanity. Challenger seals them in the room with the cylinders of oxygen, which he (correctly) believes will counter the effect of the ether. The sealing is not to keep the ether out Ã¢ÂÂ it permeates everything Ã¢ÂÂ but "to keep the oxygen in".